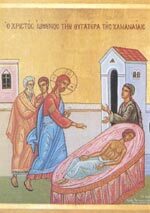 The Lord Jesus heals the daughter of the Cananite woman in Sidon, (South Lebanon). Mathew 15:22 And, behold, a woman of Canaan came out of the same coasts, and cried unto him, saying, Have mercy on me, O Lord, son of David, my daughter is grievously vexed with a devil. 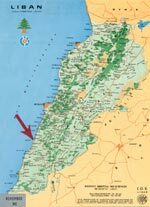 Jesus was preaching in the coasts of Tyre and Sidon who were inhabited by the Cananite Phoenicians who worshipped idols. A Cananite woman came to him crying and said to him: O, Lord, son of David, my daughter is possessed by the devil and asked him to heal her. His disciples wanted to send her away but Jesus did not answer. The woman persisted and knelt in front of him asking Jesus to help her. He wanted to test her faith and he told her that it was not good to take the bread from the children and throw it to the dogs. The Cananite woman said: but the truth is that the dogs eat the crumbs that fall from their masters’ table. Then Jesus told her that she had great faith and that her wishes would be fulfilled and her daughter was healed immediately. In the old part of the Biblical city of Sidon in the South of Lebanon, there is a square known from older times as “Canana Square” taken from Cananite as a result of the change from Aramaic to Arabic. The inhabitants of the area tell stories from their forefathers that Jesus passed through it and performed his miracle in that area of Sidon where he used to visit often to preach and heal the sick.